Whether you’re honeymooning or holidaying, stay at one of our stunning couples only resorts and let everything just drift away. You’re there to be with each other and, when you go away, the memories will be there to stay. In addition to our luxury Caribbean wedding packages we have dedicated Romance Concierges who can help you with everything from a greeting of rose petals on the bed to glorious tropical flower arrangements. 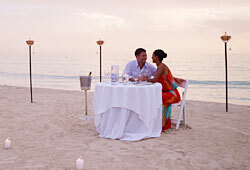 Our range of upgrades and honeymoon packages are sure to add the wow factor to your romantic break in Jamaica. Our romance concierges are experts at putting all these thoughtful details in place, so you can relax and spend time together, whether you are enjoying one of our exclusive Caribbean wedding packages, on honeymoon or simply celebrating a special holiday together as a couple. 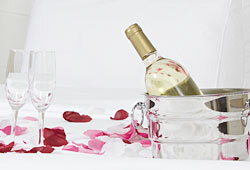 Bottle of sparkling wine on ice in your suite or room. Candles, rose petals and a bottle of sparkling wine for two. 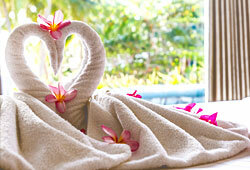 100 worth of award-winning spa treatments. A 25 minute couples’ massage. Fruit carving that asks ‘Will You Marry Me?’. His & Hers’ manicure and pedicure. $75 worth of award-winning spa treatments. Two beachfront engagement photos (5x7) taken by a professional photographer. $100 worth of award-winning spa treatment. *PLEASE NOTE: To receive your complimentary bottle of sparkling wine and a 25 minute couples massage, Couples Resorts requires a minimum stay of 6 nights and valid proof of marriage upon check-in (wedding invitations, copies of marriage licenses and marriage certificates or engraved rings). Honeymoons must commence within 30 days of wedding date.